I’m always on the hunt for fresh food, grown locally and preferably grown organically and with sustainable practices. Not only are such items healthier, they’re also almost always much more flavorful, too. You haven’t lived until you’ve tried a salad made up of greens that were cut less than an hour before. The only problem with this approach to eating is that it’s often perceived as very expensive. If you browse through the food options at your local mega grocery, you’ll usually find that healthy options, like organic fruits and vegetables, free range chickens and eggs, grass-fed beef, organic milk, and so on are usually substantially more expensive than the regular versions of the products. For a family on a budget, that’s a hard one to justify – is someone trying really hard to get by going to spend an extra two dollars a pound for organic carrots versus regular carrots? How about an extra two dollars a gallon for organic milk? It’s not something that fits well into the average budget. The secret, though, is that fresh and healthy food is often just as cheap as the regular stuff – if you bother to do a little bit of looking around. Over the years, I’ve tried all sorts of methods for getting fresher and more healthy food on our table without exploding our food budget. Here are ten tactics that work. 1. Know what’s actually available to you. One of the first challenges to overcome is knowing what’s available to you in your area. It’s easy to find a supermarket, but supermarkets are rarely where you’ll find the good deals on fresh, local produce. Here are a couple of tools to use. The 100 Mile Diet Map identifies original sources for fruit, vegetable, dairy, and meat in your area that originate from within 100 miles of your zip code. 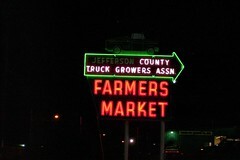 In other words, it’s a great way to find truly fresh locally grown stuff. LocalHarvest.org finds all sorts of retail sources for locally grown foods all around you. 2. Be adventurous in your food choices. While it’s easy to stick with the foods you know, doing that quite often results in paying more because you’re avoiding options that are both cheap and quite interesting. Instead of just getting the usual thing, take a look at some of the more unusual foods available to you, ones that are outside your normal diet. One great way to kickstart this is by finding out what items are actually in season at the moment and basing some of your fresh food shopping on that. If you have an opportunity to try a new fruit or vegetable or other fresh food at a very inexpensive price, don’t skip it because you’re unfamiliar with it. Instead, pick some up, go home, flip open a cookbook, and try something new – you’ll almost always be glad you did, plus you will have saved some money. I used to avoid okra, for example, but once I tried it in a dish with red beans, rice, and andouille sausage, I was a convert. 3. Shop for produce regularly at farmers markets. Your first place to shop for fresh produce shouldn’t be the produce section at your local grocery store – instead, you should start at the farmers market. The items on sale here are fresh – often just pulled from the ground in the last twenty four hours and thus still quite nutrient rich. Even better, the prices are usually a bit lower than what you’ll find for the preserved and chilled stuff you’ll find in the produce section at your local grocery store. The challenging part of a farmers market, though, is that you’ll never be quite sure what you’ll come home with. The selection is completely dependent on what’s in season, and thus you’ll not find preserved and shipped out of season items there. Thus, it’s much more difficult to make a shopping list for a farmer’s market. Instead, when you’re in need of produce, find out when your local farmers market is open and hit that before stopping at the grocery store. Then, use what you buy there as the backbone for your meal planning. Here are some useful tactics for tackling a farmers market for the first time. 4. Use farmer’s markets for information, too. While you can score a lot of tasty, fresh produce at reasonable prices from farmers markets, perhaps the best value at a farmers market is free – the information. Ask lots of questions, from how you might prepare a particular item to recipe suggestions to tips on where you might find a specific item locally. Almost everyone I’ve interacted with at a farmers market is glad to help with all of these questions. Why? First of all, they love this stuff. If they didn’t, they wouldn’t be at a farmers market. Second, they know that providing you with good information will likely make you a happy customer and keep you coming back. So ask. Ask lots of questions. Learn more about the food you’re eating and where to get more of it. A CSA (short for community supported agriculture) is a system in which people in a community become shareholders in a farm, and that share earns dividends in the form of produce. Where I live, I’ve been on a waiting list for the local CSA for almost a year, and I can’t wait to sign up. I stopped by to check out how their system works. Basically, you buy a “share” early in the year that costs around $300. This “share” earns you a giant box of produce every week throughout the late spring, summer, and early fall – twenty weeks in all (making the cost effectively $15 a box). The content of the box is basically an equal share of whatever happens to be in season at the moment – early on, it’s heavy on the lettuce, asparagus, and other greens; by mid-summer, there’s lots of tomatoes and corn; later on, you might see squashes and the like. For the volume of food you get, it’s a tremendous deal, especially considering it’s fresh and local. You can use the tools in tip #1 to find your own local CSA. You might also find that some of the people at farmers markets also run CSAs, so they may be able to give you a lead, too. 6. Start your own garden. A garden is a tremendous hobby to undertake. It requires a significant time investment and some initial cost as well (basic equipment and seeds). However, few things beat the ability to walk out in your yard and pull a handful of tomatoes straight from the vine to use with that night’s dinner. Not only is it impossible to eat anything fresher, the cost involved is quite low. It’s even lower when you add in the concept of gardening as a hobby when compared to other hobbies. An hour spent in the garden, if you enjoy it, is an hour well spent, never mind the fact that it provides some financial and nutritional benefit over the long haul. 7. Share a garden with someone else. If you don’t have adequate space for your own garden, consider an arrangement where someone else has space for a garden and you share resources and effort. For example, you might place a garden in a friend’s yard, then spend some time each Saturday or Sunday afternoon over there getting it in shape with your friend, then splitting the fresh produce. Not only does this provide you fresh food, it also transforms gardening into a social activity that you can share with a friend. Even a medium sized garden can provide a good amount of fresh produce for two families, and with a partner you can spread out the costs of the materials and the effort, too. A win-win all around, and it gets tasty fresh produce on your table. 8. Establish a bartering relationship with someone who gardens extensively. Another option, particularly if you have marketable skills, is to swap those skills with a friend that is an avid gardener or produces some other sort of fresh food. For example, if your friend needs help with some electrical work, offer to give him an afternoon’s worth of help in exchange for a few pounds of tomatoes in August. Again, this turns fresh produce into a win-win. Not only is it free for you now, you’ve also got an afternoon at a friend’s house, helping him or her out. Good conversation, an afternoon well spent, and some fresh food later on? You can’t beat it. 9. Use your grocery flyer to identify healthy sales, then plan around them. If you don’t have many options available to you for getting such fresh produce, you can still rely on your local grocery store for options. Know what items are actually in season at the moment and use that knowledge in tandem with the local grocery store flyers. When you see in-season items on sale, jump on board – such sales are usually based on highly local purchases, plus they’re cheap. Since you have the advantage of knowing the fresh produce you’ll have, use it as the backbone for your meal and shopping planning. Find recipes that use these fresh items, then construct a shopping list out of what you need for these recipes. 10. Join your local Slow Food convivum. A final tip: be social in your dedication to fresh, local food. Find others that share your interests, so you can share your ideas about where to find inexpensive, fresh, local foods. The most effective way to do this is to get involved with Slow Food. Slow Food is an organization dedicated to “slow food” – the opposite of fast food. They organize into local chapters (called conviva), where people meet and share ideas about eating locally and often share information online, too. These groups are treasure troves of information on inexpensive, local, fresh produce and well worth looking into if you’re interested in the topic.